Interim Man Utd boss Ole Gunnar Solskjaer has revealed that Antonio Valencia and Matteo Darmian will play no part against Paris Saint-Germain. The Red Devils have gone 11 games unbeaten under the Norwegian tactician since he took charge in December, and they’ll be hoping to take that form with them into the Champions League. Solskjaer’s side face PSG in the first leg of their last-16 tie at Old Trafford on Tuesday night, with both sides undoubtedly desperate to take an advantage into the second meeting next month. 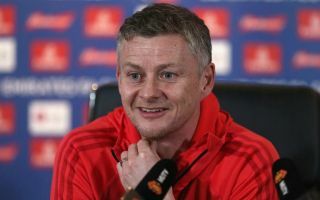 In order to maintain their current momentum and unbeaten run across all competitions, Solskjaer will certainly need as close to a fully-fit squad as possible at his disposal. Although he confirmed that both Valencia and Darmian are out in midweek and for the more immediate future, he sounded relatively pleased with the level of depth available to him. “We’re missing Antonio [Valencia] and Matteo [Darmian], they’re the two that are not available,” he told the club’s site. In truth, given neither defender has featured particularly prominently since Solskjaer was appointed, it’s unlikely that Man Utd will miss them too much. Nevertheless, with the business end of the season upon them, coupled with the fact that they’re fighting on three fronts still, the interim boss would undoubtedly prefer to have a full squad available in the coming weeks to try and sustain their impressive form. For now though, the focus is on PSG and ensuring that they have something to defend when they visit Paris. With Ashley Young or Diogo Dalot available to play at right-back, the absences of Darmian and Valencia shouldn’t matter too much on Tuesday night.